In 2007, Clear Vision Eau Claire was founded on three basic principles: preserving the quality of life, transforming the local economy and empowering the individual. This is based on the belief that active and meaningful citizen involvement in planning the future of our community will result in a commitment to make the desired, envisioned future a reality. It has been 10 years since Clear Vision brought over 200 citizens together for ten meetings to imagine what our community would be like in 2020. In a July 2008 plan, six key performance areas were identified and 125 actions steps. Not everything was accomplished…but a lot was! Like Pablo Center at the Confluence, Sculpture Tour Eau Claire, Community Gardens, Safe Routes Bicycle Map of Eau Claire County and more. The Eau Claire area is on a roll and Clear Vision is ready to help keep it moving by fulfilling our mission of Engaging Citizens for the Common Good. It is time to “Renew the Vision” and create a new plan for the next ten years. 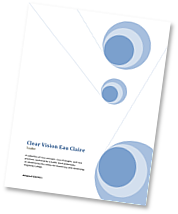 On November 30, 2018, Clear Vision launched a survey aimed at assessing the past and planning the future. Community members are encouraged to register and complete the short three question survey. Registration is required and includes only first & last name, email address and zip code. None of the information is shared and individual responses are not visible. The survey will close mid-January. Survey results will be used to start the conversation at four upcoming visioning sessions. Our Community 2030…Renewing the Vision sessions will be held at the Pablo Center at the Confluence from 6:30 pm – 9:00 pm on the following Thursdays in 2019: February 21, March 14, April 4 and one final event to be announced soon. Attendance at all is encouraged but not required. Click here to take the ‘Our Community 2030’ Survey!